How to install and configure Apache, MySQL and PHP on Mac OS X 10.7 Lion and OS X 10.6 Snow Leopard. Apache and PHP already come preloaded in OS X 10.7 Lion and 10.6 Snow Leopard, the versions on 10.7 Lion are PHP 5.3.6 and Apache 2.2.20, these 2 pieces of Open Source software are part of the “AMP” stack with MySQL the missing third component. Their are other options for Mac users to install an AMP stack using prebuilt point and click downloads including the following, MAMP, DAMP, XAMPP and BitNami – these installations use separate binaries outside of the regular OS X software so no conflict occurs and it makes it easier to delete the stacks without affecting other parts of the operating system. However sometimes you need to configure these with different port numbers and this can lead to issues and there is the question of vendor support and application versions. This tutorial bypasses the 3rd party AMP stacks and uses the native installed components with the exception of MySQL which is a separate install, unless you have OS X Server, which then MySQL comes preloaded in 10.6 but not 10.7 which has dumped MySQL in favour of PostgreSQL instead – you can still install MySQL on 10.7 Server with the instructions below. To get Apache, MySQL and PHP running natively on OSX is quite easy and straightforward – this guide should have you up and running in no time. This guide uses the command line to achieve some text editing of various configuration files, however If you aren’t comfortable in the Terminal you can do this in a graphical mode, download a free text editor utility call TextWrangler, launch it, when you come to edit one of the configuration files, open file, you have to click on “show hidden items” at the bottom of the open dialog box to see all of the system files. But you will still need to use the terminal for some of the commands which don’t involve editing files. So now onto the 2nd piece of the puzzle, MySQL. You need to download it from http://dev.mysql.com/downloads/mysql/, chose Mac OS X ver. 10.7 (x86, 64-bit), DMG Archive for an Intel Mac the .dmg file is a point and click installation nice and easy, you can download the tar.gz also for a command line install. The easiest format is the .dmg file as it allows for an installation visually using the GUI. 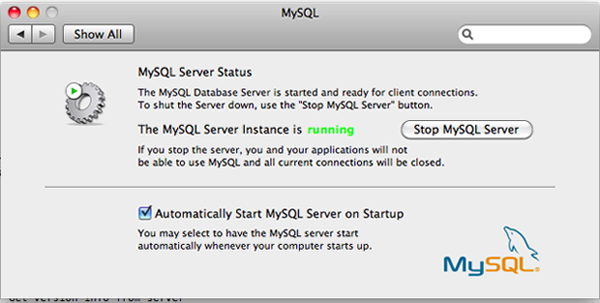 Once the installs are done you can start the mysql server right from the System Preferences which has a new preference in the “Other” category called “MySQL” click start and now it is running. Type 'help;' or 'h' for help. Type 'c' to clear at the current input statement. 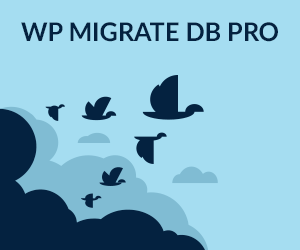 then mysql was not started, go back to the System Preference and start the database. Go ahead and just hit enter if this is a new installation and no password currently exists, follow the prompts to set up a new root password – this is a root password just for mysql separate from the root password of OS X you should set this. If this is a new installation you can just answer yes to the questions. So thats the two components installed with MySQL having a System Preference option to Start/Stop the database. 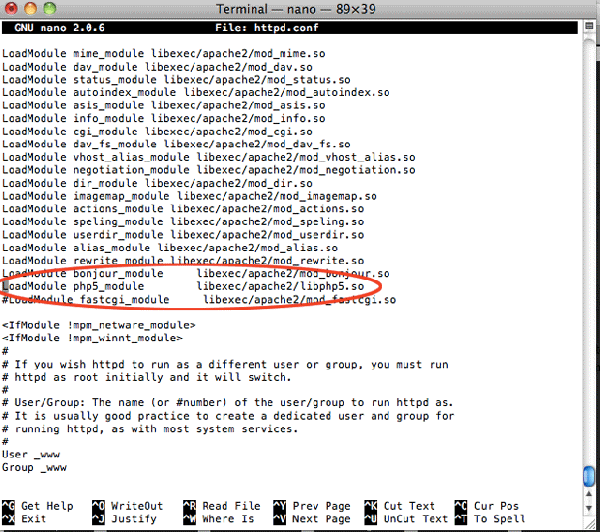 You can start/stop the Web Server Apache in the System Preferences under Sharing and checking the WebSharing box. (Sometimes you may have to toggle it on/off a few times to get it going). You should see the full PHP configuration page. 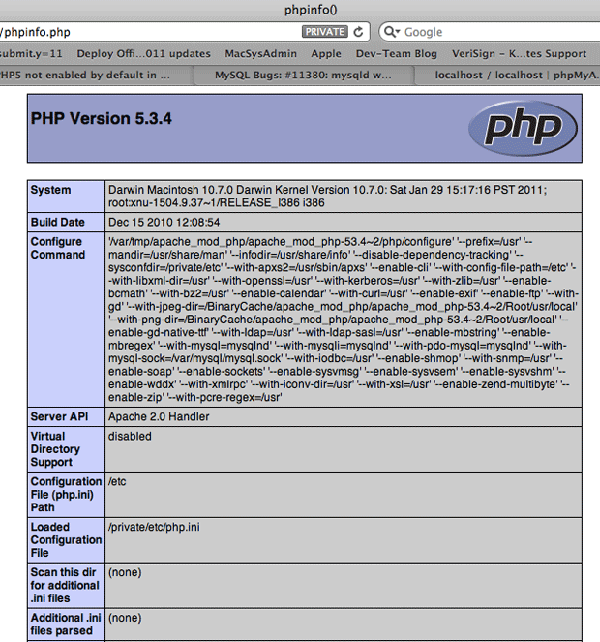 If you just see the code restart the web server to make sure the php module is loaded. That’s it you are ready to develop and share! The only difference between 10.6 and 10.7 are some incremental version numbers on Apache and MySQL otherwise the process is the same for both operating systems. To get up and running with mysql and use phpMyAdmin to manage the mysql database, there is a guide here. Then look at installing WordPress, Drupal and Joomla!! !